Coolers with speakers are a one-of-a-kind gadget. Compact and portable, they are the ideal accessory for days at the beach, camping, backyard barbecues, and picnics. Not only will they hold your beverages and keep them cold during your event, but you, your friends and family members can enjoy your favorite music via an on board radio or speakers. 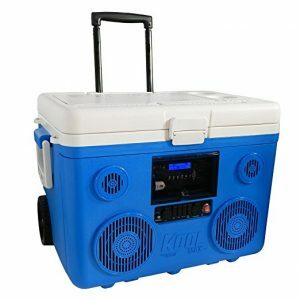 Owning a cooler with speakers can save money as you don’t have to purchase a radio sound system and a cooler separately. Additionally, they are usually very user friendly. To listen to music through the speakers, all you have to do is plug in or pair via bluetooth your MP3 player or mobile device and you are good to go. As with any product, the features vary on coolers with speakers according to the price. There are those that come with amenities like bass control, AM/FM radio, and portable wheels. 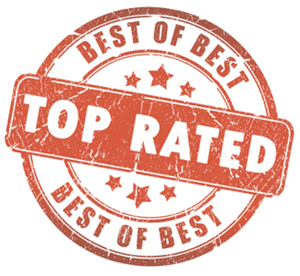 For these features, the price will be slightly higher than those of others with fewer features. Another feature some offer are coolers with speakers that are constructed into a backpack or tote bag. If you will be in the pool for the day, you should consider buying a floating cooler with speakers. Whatever good time you plan on having, coolers with speakers are the perfect companion. 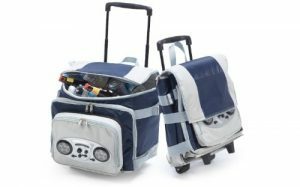 Coolers with speakers are often small and compact, making them as portable as possible, often coming with wheels or foldable. As far as height and width, they typically run from 20’ to 33’ inches, depending on whether the cooler with speakers is on folding legs. The average weight for coolers with speakers is from 1 to 15 lbs. The weight of the cooler with speaker increases according to how many features it contains. For example, the ones with wheels, handles, and can hold a huge number of drinks will be heavier than the ones that don’t have any of these amenities. These larger coolers may be better situated as an outdoor and patio cooler. 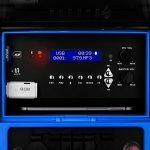 As if owning a Yeti wasn’t cooler enough, there is now even a way to add speakers or a radio to your favorite Yeti, Engel or other roto molded cooler. There are a few DIY instructions available online like this. The options are virtually endless in terms of sound system setup, lights, etc. Many of these systems can even charge your phone (or even additional phones/devices) while playing music. Most recommend using marine grade speakers to prevent any potential water damage if you were to take the cooler on a boat, tubing trip, etc. Who Would Benefit from a Cooler Radio? Individuals that would benefit from owning coolers from speakers are those that do a lot of outdoor activities or entertaining. If you plan on spending a nice summer day at the park with someone special, a backpack or tote bag cooler with speaker will serve you well. It can hold your water and drinks, food/snacks, as well as serve as musical entertainment for you and your companion. Moreover, you might be able to keep your children occupied with an audiobook while you focus on driving. 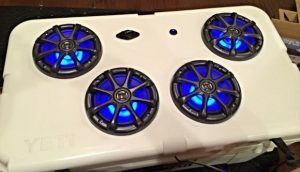 Why Is An Ice Cooler With Speakers A Good Purchase? The best thing about coolers with speakers is that they are inexpensive. The price usually run from $24 – $100. There are those that are more expensive, but these are usually customized to suit a Yeti Cooler, Engel, etc. However, they will benefit you if you are entertaining a huge group and need big cooler. If you do not need to keep 58 cans, for example, cold for a long period of time, you can save your money and get a smaller cooler with speakers. 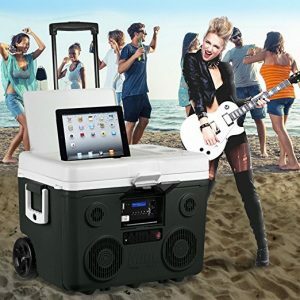 This party cooler allows you to turn up your favorite tunes and listen to them through 2 high-powered speakers. BREKX can connect to any Bluetooth enabled device that is up to 35 feet away or through an auxiliary chord. The cord is included with the cooler. These speakers are water resistant, which means cooler sweating or splashes will not damage them. The speakers are powered by an amplifier that requires 4 AA batteries. It is rust and leak-proof. It measures 23 x 17 x 18 inches and weighs 22 pounds. This ensures that you can take it on the patio, beach, or any place else that the party may be. This 40-qt. cooler can hold up to 48 cans or 28 bottles. It can keep ice frozen for up to three days and comes in your choice of four colors, including: blue, black, orange, and red. It also has a detachable flashlight that requires 3 AAA batteries. You can connect your favorite Bluetooth enabled device or listen to your favorite radio station through 6.5” water resistant speakers and two-inch-high performance tweeters. There is also a microphone/instrument input, auxiliary jacks, USB port, and SD card slot. It has a built-in rechargeable battery that can last for up to 16 hours on a single charge. If your party is going to last longer or you forget to charge it; you can also use the AC/DC adaptor to power it. 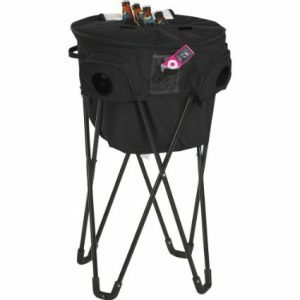 This cooler weighs in at 38.6 pounds and measures 26.2 x 18.5 x 19 inches, which is ideal for most party spots. 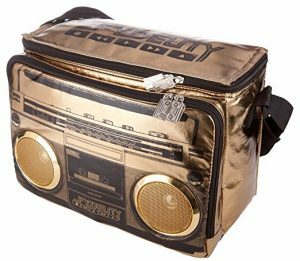 This stylish cooler looks like a golden jambox, but yet holds your favorite beverages inside. 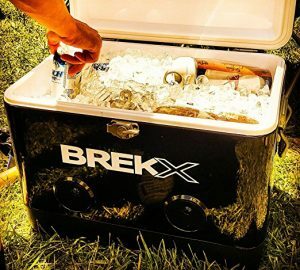 It is a soft sided cooler that can hold up to 18 cans. It works with any smartphone or tablet through a 3.5mm headphone jack. It is powered by 4 AA batteries and provides you with 8+ hours of music. The speakers are splash resistant and they are backed up by a 3000-milliwatt amplifier. 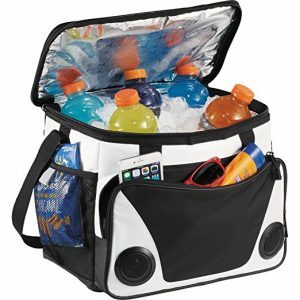 When empty, this cooler weighs only 2.3 pounds and measures 14 x 9.5 x 7 inches, which is ideal for most beach parties, camping trips, etc, where portability is key. 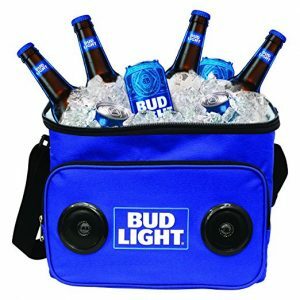 With this cooler, not only can you can enjoy showing your love of Bud Light, but your love for music. It is a soft cooler that can keep your drinks and your lunch cold for hours. You can easily connect any Bluetooth enabled device to it and then sip on up to 24 cans of your favorite beer or soda. 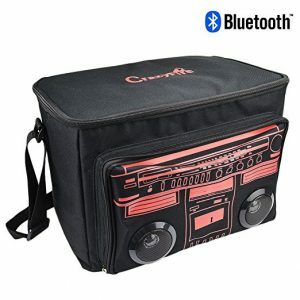 This cooler is rechargeable, so you do not have to worry about changing batteries and it has a front zippered pocket for you to put your music device or other personal items inside of. Even with speakers, it is very lightweight at only one pound when empty. It measures 9x13x10 inches, which ensures that you can easily carry it on your shoulder. This bag is perhaps one of the most practical on the market. 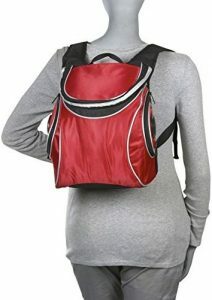 It is ideal for beaches and as mommy bags to the park. 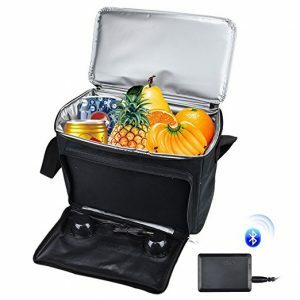 Food and drinks will stay cold while you listen to your favorite music using your smartphone, tablet, or MP3 player. You can connect via Bluetooth or cable and it works with virtually all devices. It weighs in at only 1.8 pounds and measures 15.3 x 9.1 x 10.2 inches and can hold up to 24 cans. The interior is waterproof and there is an outside pocket that zips closed to protect your personal items. A single charge lasts about 2 hours, which according to most is fine for a trip to the park and enjoying a picnic. This cooler is unique because it is more of a water jug than a cooler. 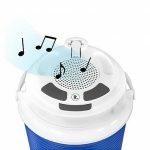 It functions as a jug for your favorite beverages and provides you with outstanding speaker quality through a single speaker in the lid. It works well with most Bluetooth devices and can even charge them by connecting to the 4400mAh power bank. The charging cable is included and on a single recharge, you can get up to six hours of use before needing to charge again. This cooler measures in at 13.8 inches tall and can be purchased in either red or blue. 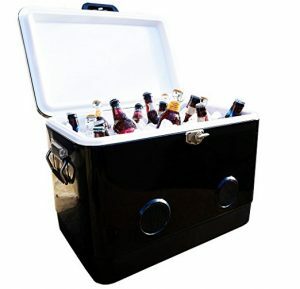 This soft sided cooler can hold ice for an impressive two days and can hold as much as 24 cans. It is extremely easy to clean. There are two zippered areas to keep items separate from your personal items. If you need more storage, there are two mesh pockets on each side of the cooler. It connects to most all Bluetooth enabled devices and you can stream your favorite movie or music through two speakers. It measures in at 12 x 10.5 x 15 inches. It weighs only 1.9 pounds and a single charge can last for up to four hours. 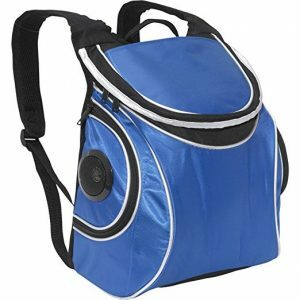 You can carry your cooler with ease and on your back with this backpack style cooler. It is available in three colors, including red, blue, and yellow. It can work via jacks to MP3s or CDs. It can be powered by a 9v battery or an AC/DC adapter jack. This backpack holds up to 18 cans of your favorite beverages and it is built to last with 600-dernier nylon on its exterior. 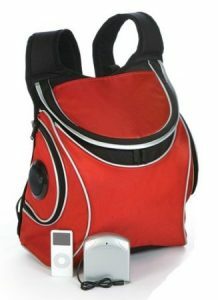 It weighs 1.8 pounds and measures 7 x 14 x 12 inches so that it is easy to carry even when weighed down by your beverages. 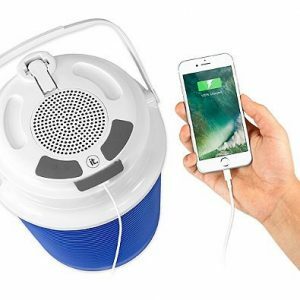 One example of a more expensive cooler with speakers is the Picnic Plus Cooler Radio. This product features sturdy wheels, a pulley handle, two-speaker console with MP3 connection. It holds ice, 60 beverage cans, as well as 2-liter bottles upright. There are a number of exterior pockets that hold napkins, sunscreen, cutlery, and plates. This is the one to have if you are entertaining a large group, such as a family gathering in the park/backyard or a marshmallow roast for you and your friends. Another popular cooler with speakers is the Picnic Plus Cooladio Tub Cooler. This one is portable as well as collapsible. It comes with a stand for the cooler with speakers to sit on, and it is easy to assemble. It is a huge seller because not only does it keeps up to 72 cans cold and holds ice, it also possesses a leak-proof lining and has a drain plug. Additionally, it comes with a carry bag and amplifier. This setup works great for those that are entertaining a large group similar to a barrel cooler.